Room rate: $289 for single and double occupancy + applicable state and local taxes, which are subject to change. $223 government rate, subject to availability, proof of eligibility will be required at check in. Please email sohara@ame.org for information on how to book the government rate. Individual reservations require a credit card guarantee. One night’s room and tax will be charged if the guest cancels after 3:00 p.m. (CST) 72 hours prior to arrival date. Click here to book online! Cut off: Friday 10/11/19; Reservation requests received after the cutoff date may not be eligible for the group rate. 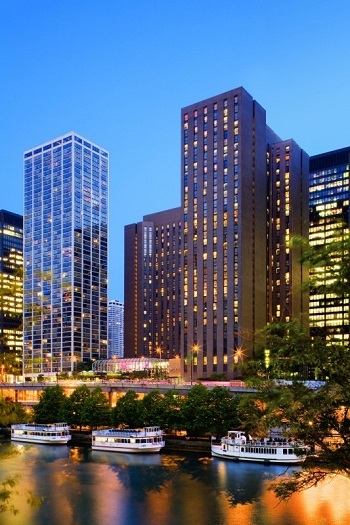 Located across the Chicago River from Hyatt Regency Chicago, Chicago Water Taxi offers riders access to Ogilvie Transportation Center, Union Station, Willis Tower, Chicago Riverwalk, Chinatown, and more via the city's waterways. If you want to explore Chicago by bike, stop by the conveniently located Divvy station at Stetson Avenue and South Water Street and enjoy 24-hours of unlimited 30-minute rides for $9.95 per day. WARNING ABOUT SPAM: We are aware of emailing and phishing techniques underway by groups who do not have a relationship with AME. This is a global issue among the trade shows and conventions community. These groups are purposely posing as official hotel agents for a multitude of events while making fraudulent claims. No one should contact you directly to book your hotel room or offer you a “special discounted room rate.” We caution you to protect your personal data whenever you book accommodations.